I have to tell you about one of my favorite tools to increase productivity and focus – Momentum. I may be late to the party, but if any of you are not familiar with this great plug-in for Google Chrome that acts as a home page dashboard, you’ve got to check it out. I learned about it from Jim Peacock, a career-coaching colleague, and it’s been a game changer for me. 1) The night before, or first thing each morning, think through what your highest priority item of the day is. The first thing I see when I open my browser is the question, “What is your main focus of the day?” This prompts me to really stop and think through what my highest priority for the day is, if I haven’t done that the night before. I also have to fill in a blank with my main focus that adds to my commitment to that priority. Without thinking through my highest priority, and committing to it, I often fall into the tyranny of the urgent – accomplishing a lot of tasks, but not making progress towards my key goals. 2) Keep your highest priority item front-and-center all day. Momentum reminds me continually what my main focus is. Every time I open my browser throughout the day, my priority is center of the page. This helps me get back on track when I’m interrupted or pulled away to respond to different needs. When I accomplish my main focus I can either mark it completed and add a new one, or just call it done. 3) Use nature to increase focus and mental energy. Momentum features a picture of incredible natural beauty each day. Each day features a picture of incredible natural beauty. There is much research about the restorative power of being outdoors in nature. But studies show that even looking at pictures of nature increases mental energy, lowers stress, increases job satisfaction, and can improve memory by 20%. I’ll take it. 4) Keep your secondary to-dos in view. I love that Momentum includes a spot in the lower right corner for me to add other to-dos, so I can stay on track and not drop balls. But on days that I just want to keep my main focus my only focus, I don’t have to add any to-dos. My choice. 5) Use inspirational quotes to increase positivity, motivation, and intentionality. 6) Recharge throughout the day. “The brain’s ability to self-regulate–to stay disciplined–wanes with each exercise of self-control during the day. It’s a loss of resources that must be replenished, or it becomes harder to stay on-task, be attentive and solve problems.” Momentum offers the option of “Balance Mode” where you establish periods of uptime and downtime each day. During downtime you turn off the productivity features – so you’re reminded to take a break – whether you walk outside for a bit, or just take a few minutes to view the beautiful picture, breathe, and rest. 7) Own that you have the power to choose. Realizing and embracing that we have the power to choose – stepping up to take personal responsibility for our actions and attitudes – positively affects our motivation, performance, and productivity. Momentum is fully customizable – you can design your home page dashboard the way that works best for you. In the settings panel, you can choose to show the to-dos, or not. You can include the daily quote, or not. 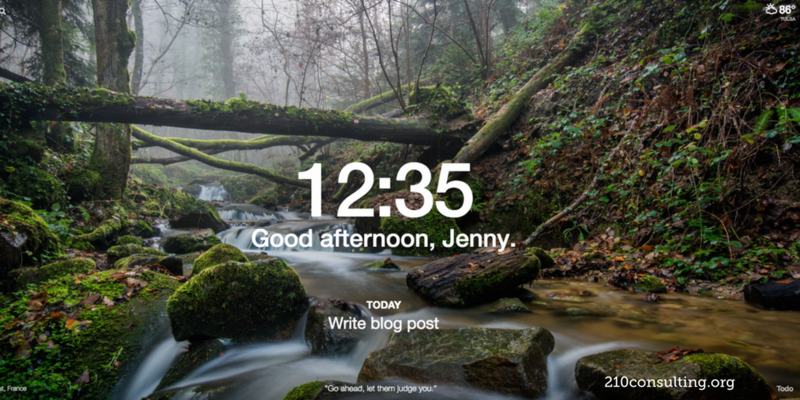 You can favorite the images and quotes and add your own favorite quotes and favorite pictures to the rotation. I would love to hear about your favorite features, if you’re already using Momentum, or about any other productivity and focus tools you’ve found.